Overseas-bound Filipino workers, specifically those who were hired to work in South Korea under the Employment Permit System (EPS), need not worry sourcing for funds to pay for their long list of pre-departure fees and other mobilization costs, thanks to the Memorandum of Agreement entered into by Landbank of the Philippines and the Department of Labor and Employment - Philippine Overseas Employment Administration (POEA). The MOA seeks to implement the OFW Pre-Departure Loan (OPL) Facility to provide departing OFWs under the South Korea EPS program financial assistance, specifically in defraying the mobilization costs and in providing their family some amount of money while waiting for their remittances. 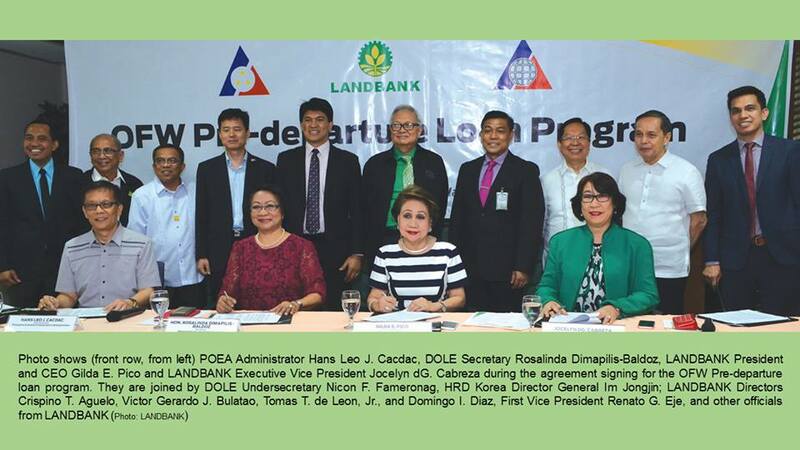 Labor and Employment Secretary Rosalinda Dimapilis-Baldoz said the DOLE-POEA-Landbank tie-up will provide accessible and affordable source of financial assistance comprising of a loan amount of P52,000 which is payable in 12 equal monthly amortization, and with fixed interest rate of 10 percent per annum. To be qualified for the special loan package, the OFW must be at least 21 years old and enrolled in Landbank banking programs, such as Landbank Auto Save Account and Credit Life Insurance. They must also pay the processing fee, execute the OFW deed of undertaking to pay the loan; and enrol their Landbank account under the mandatory account requirement of HRD Korea in its computerized system for insurance benefits at the end of the worker’s stay in Korea. “The OFW Pre-Departure Loan is intended to improve the introduction period of EPS workers by at least one week of deployment within three weeks upon receipt of the visa confirmation,” said Baldoz. The cost of mobilization for selected EPS workers totals to P21,879. This includes payment for mandatory TB test (P1,028); re-medical fee (P1,200); preliminary training (P500); e-Receipt or the Overseas Employment Certificate consisting of POEA processing fee, OWWA contribution, PhilHealth premium, and Pag-IBIG contribution (P5,786); visa fee (P2,250); airfare (P11,000 but would shoot up to P16,000 on peak season); and NBI clearance (P115). “With this government assistance, we are confident that the strong cooperation we have with the Government of South Korea for the Employment Permit System will continue to be sustained in a very proactive way. This is a mechanism we are putting in place for our OFWs to enjoy the higher quota for the Philippines. 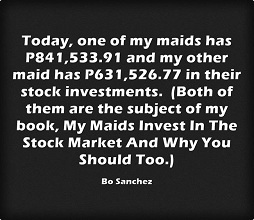 This year, the labor quota for the Philippines is 6,800,” the Labor chief said. Baldoz is optimistic that the OFW beneficiaries of the loan program will be committed in enabling this new OPL program to likewise continue and benefit more OFWs by paying their loan obligations. “If we are successful in our EPS sector, we see every reason for other OFWs to also get access to this OPL Facility, through the auspices of Landbank,” said Baldoz. It can be recalled that the Department of Labor and Employment has entered into a Memorandum of Agreement with the Korean Ministry of Employment and Labor (MOEL) for the implementation of the Employment Permit System, which has begun in 2004 at the time when Secretary Baldoz was the POEA Administrator. This bilateral agreement made the Philippines as one of the original six countries that signed in April 2004 the EPS memorandum of agreement with South Korea’s Ministry of Employment and Labor. The Korean government adopted the EPS to introduce non-professional foreign workers in its small and medium industries under a transparent and efficient process of selecting, sending, and receiving foreign workers through a government-to-government arrangement. The EPS, Secretary Baldoz added, has become a global model for ethical, efficient, and transparent recruitment that has benefited South Korea’s SMEs and the Filipino workers as well who have acquired a number of skills and competencies from the global labor market. The DOLE designated the Philippine Overseas Employment Administration (POEA) as the sending agency while the MOEL designated the Human Resources Development Services (HRD) Korea as the receiving agency. The EPS has an annual average deployment of about 4,000 workers. Currently, EPS workers receive a monthly salary equivalent to USD1,200 exclusive of overtime. In 2004, the monthly salary of EPS workers was equivalent to USD500. Yearly, the Korean Government Council assigns a corresponding labor quota ceiling for each 15 EPS sending countries, which includes the Philippines. The assignment of labor quota is based on certain criteria, such as preference of employers, rate of illegal stay, and period of introduction or process duration on entry of workers to Korea upon confirmation of visa.